Hammers legend Phil Parkes reckons Andy Carroll is going to have a really tough job on his hands getting back into the team when he finally returns to fitness. Eye witnesses at last night’s Development Under 21 game under the flood lights at the Boleyn Ground claim Kevin Nolan played a centre back role for beginning and end of the match. Diego Poyet admits he could hardly be happier with his West Ham life! 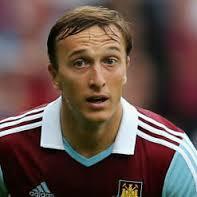 Mark Noble has a real chance of returning to the West Ham team for the clash with Queens Park Rangers this weekend. David Gold has given has reacted humorously on the whispering campaign over Andy Carroll’s future at the club. Elliot Lee scored twice as the West Ham Under-21s claimed their first win of the season last night beating Sunderland 2-0 at Upton Park. Tony Cottee believes the Irons were hard done by at Old Trafford on Saturday. Leroy Rosenior believes Winston Reid – at £60,000 a week – is ‘cheap at half the price’ to West Ham!. Jack Collison will be hoping to make Ipswich Town debut with the club this week but clearly still has the Hammers – and the club’s fans – in his heart.